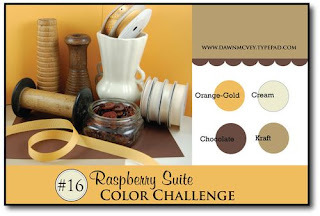 Dawn McVey Raspberry Suite Color Challenge #16 again! and of course the backside. Since I really wanted to submit something else into Dawn's challenge I decided these cute card/stationary holders that I bought at Ink and Stamp with Sue in Galena, IL would be perfect. They were 50% off so I just couldn't pass it up. This is the smallest of the three. The are heavy cardboard just screaming to be decorated. and SU vanilla for the stationary. The SEI paper is one of my favorites. I liked it so much that I bought 2 packs of it (not at the same time). Yeah call me crazy... but I never pay full price... 50% coupons from Michael's are wonderful for this sort of thing. 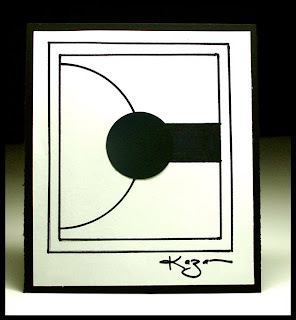 Here is the card I created for the Unity Stamp Company's September Challenge. You had to use green, purple, orange and black. My goal was to create a Halloween card but I had one problem... I don't own any Unity Halloween stamps. So I glanced at my wooden stamps to see if there was anything I could use and the big clock face was starring at me. Here is what I came up with and I am really happy with it. Stamp is Unity and ink is elegant eggplant. I used SU ribbon, elegant eggplant, pumpkin pie and always artichoke. The stickers are by making memories (cheeky shimmer stickers). The paper is SU always artichoke and the designer paper is from making memories (Halloween). This is my first official Halloween card.... who shall I send it to or do I need to make 3 more so all our nieces and nephews get one in the mail? Hmm I think I will be making some more! Here is another challenge from Dawn McVey! What do you think of these colors? I also used the layout for 2 Sketches For You on this one. Double the challenge... double the fun! Stamp set is from Unity. It is their August set that is available only in stores and is WELL worth it. I just got mine and now the September one is out which is a must have. My paper is SU except the cream. I used a retired dp, chocolate chip, kraft and more mustard. I used memento brown ink to stamp and a copic marker for the details on the cars. This card is my anniversary card for my husband. We had our 2nd wedding anniversary today. He had to be out of town for work so we celebrated over the weekend and a wonderful time! I hope you like my card and please tell me what you think.